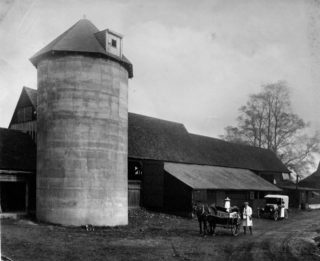 The Barn Theatre’s home is in part of the farm buildings of Lower Handside Farm. In the early days of the Garden City the building had been a model dairy and in 1931, inspired by Dr Leonard Grey, work commenced to convert the barn into a theatre. Dr Grey purchased 148 second-hand cinema seats and some lighting from a source in St Albans, and the theatre opened for business on 4 January 1932 with four one-act plays. The Barn was unique as the only theatre in Hertfordshire entirely owned and run by amateurs and was used extensively by the town’s four drama groups. During the war the Barn was taken over by the army, and later used as a Sea Cadet Training Centre. By the end of the war it was in ruins. Much of its equipment was lost, the boiler had burst, curtains had disappeared and all the raked floor had been removed plank by plank to build poultry huts to help the war effort. It took many years to restore it back to its original condition. In 1969 the Barn Theatre Club was formed, and in 1984, after a huge campaign, the Barn members finally raised enough money to buy the theatre outright, ensuring, as it does today, its future in Handside Lane. This page was added on 04/06/2009.